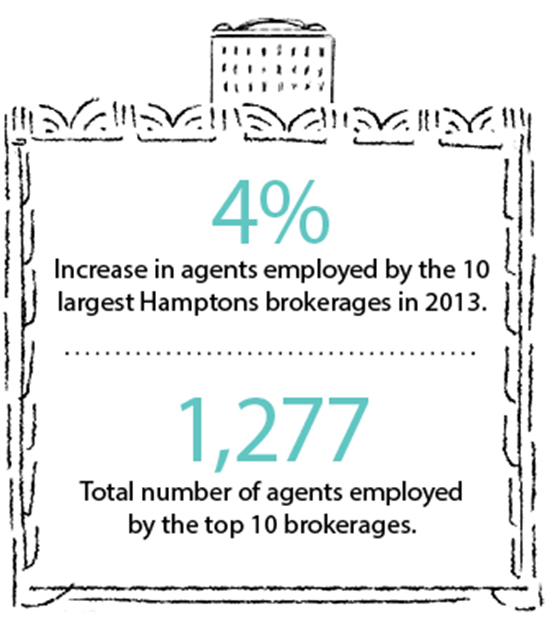 The biggest 10 brokerages on Long Island’s East End, encompassing the Hamptons and the North Fork, employed a combined 1,277 agents last year. That was up from 1,230 in 2012, as the market continued to grow stronger. The rankings remained largely stable, except that Douglas Elliman moved to the first spot again after losing to the Corcoran Group In 2012. Source: First published in the July 2013 issue of The Real Deal. Agent numbers are from firms’ websites as of early June. Figures do not include managers and administrative personnel.